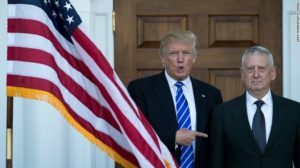 The man apparently selected as President-elect Donald Trump’s defense secretary is seen as a consummate outsider who vehemently opposed President Barack Obama’s nuclear deal with Iran. Gen. James “Mad Dog” Mattis is “the closest thing to Gen. George Patton that we have,” Trump said. For Mattis to assume the post, he would need Congress to waive a federal law that bars anyone who has been on active duty in the last seven years from becoming defense secretary. Mattis retired as commander of the U.S. Central Command in 2013 after a more than 40-year career in the Marine Corps. Rep. Mac Thornberry, Texas Republican and chairman of the House Armed Services Committee, called Gen. Mattis “an excellent selection” and signaled that he’d help push the needed waiver. “I will work with my colleagues in the coming days to clear the way for his confirmation by the Senate,” he said. Paul McHale, a former assistant defense secretary in the George W. Bush administration, said that Mattis, who was unceremoniously forced out of the Pentagon by the Obama administration over his opposition to the Iran nuclear deal, was already finding strong support on Dec. 1. “The public will quickly recognize a person of deep character, strong intellect and administrative skills that go beyond the courage and leadership he has shown on the battlefield,” McHale said, adding that Mattis will pay huge dividends as Defense Department chief. Former Army officer and strategic analyst Ralph Peters, writing for FoxNews.com on Dec. 2, said “I trust Jim Mattis because he’s a man of character, that most un-Washingtonian quality. His public image is of one rough-and-tough Marine, but the man I’ve encountered is, above all, one of integrity. His code of honor is so out of fashion that one has to reach back to a Victorian vocabulary: He has a noble spirit. “And he’s a genuine patriot, not a shouter with his eye on the next chance. He will do what’s right, not what’s expedient. And he will never go along with anything he believes might harm our country. If confirmed, Mattis would be the first ex-military officer to head the Pentagon since President Harry Truman selected George Marshall for the post in 1950. “Mattis is not someone who is going to prioritize wishful thinking over the reality of the world we face,” said Michael Rubin, a former Pentagon adviser and expert on rogue regimes. Rubin said Mattis has the experience necessary to implement tough reform while keeping America’s fighting force nimble and well equipped.